I am a huge Halloween fan. Right now because the kids are still young enough, I can get away with us all wearing themed costumes. Last year I was Alice, my Husband was a Card, and my kids were Dweedle Dee and Dweedle Dum!! I can't wait to show you our costumes for this year, but they have to stay a secret just a little longer!! This is our first Halloween with Kevin. We of course bought him a costume to go along with our theme!! I bought him another costume the other day to see how well he would handle being dressed up. He was not as easy to keep clothed as Sammy was!! Here is Kevin in the costume. It's hard to tell, but he is wiggling constantly and eating the costume!! Sammy was usually much better with keeping her clothes on!! It must be a girl thing!! This was our theme back in 2012. Do you have pets that you dress up for Halloween?? I have seen not only dogs, but cats, bunnies, and even a lizard get dressed up before!! Milk Bone has come up with a great list of Halloween stats about how pet parents and their furry friends celebrate the holiday. Can you relate?? Although Halloween has usually been considered a children's holiday, these days increasing numbers of "furry kids" are getting in on the fun. Milk Bone would really like to get you and your pets excited for Halloween. Make sure you take a picture of your baby dressed up in their costume and tag it on Instagram, Facebook or Twitter using hashtag #TreatsForAll. 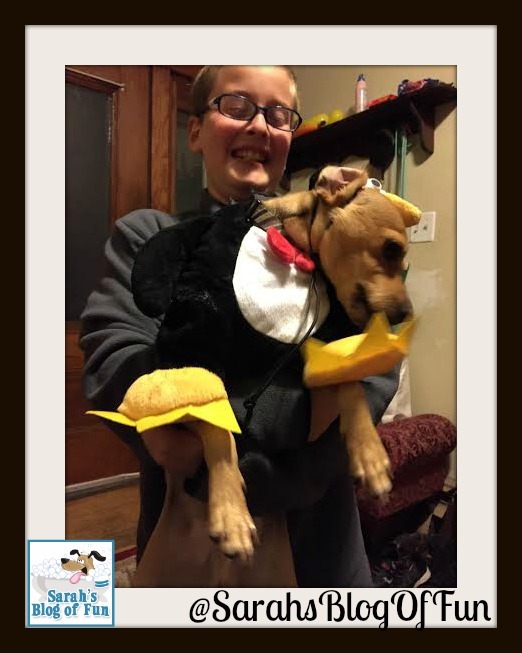 Your baby could be shown on Milk Bones Halloween site!! How would you like to win your puppy some extra special Halloween treats?? 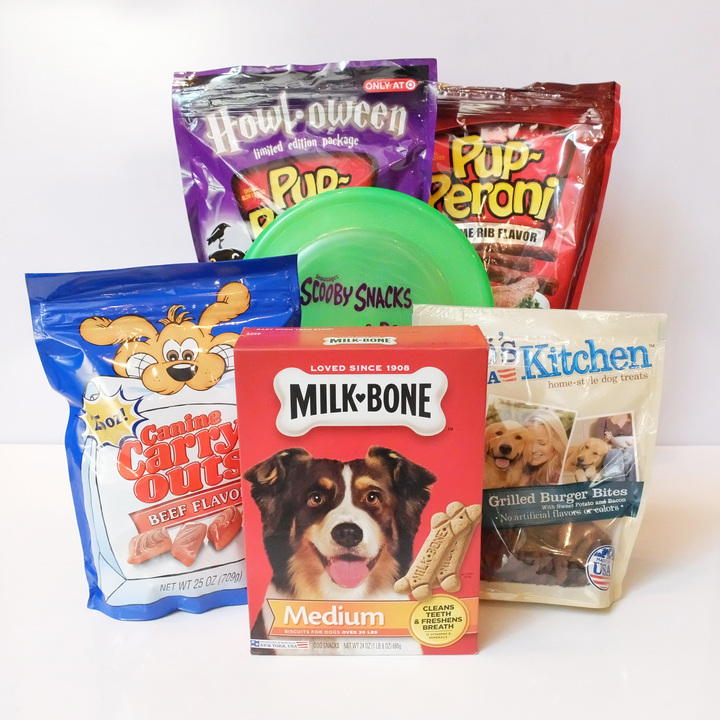 Milk Bone would like to offer one lucky reader this terrific prize pack of fun treats. Enter using the rafflecopter form below. 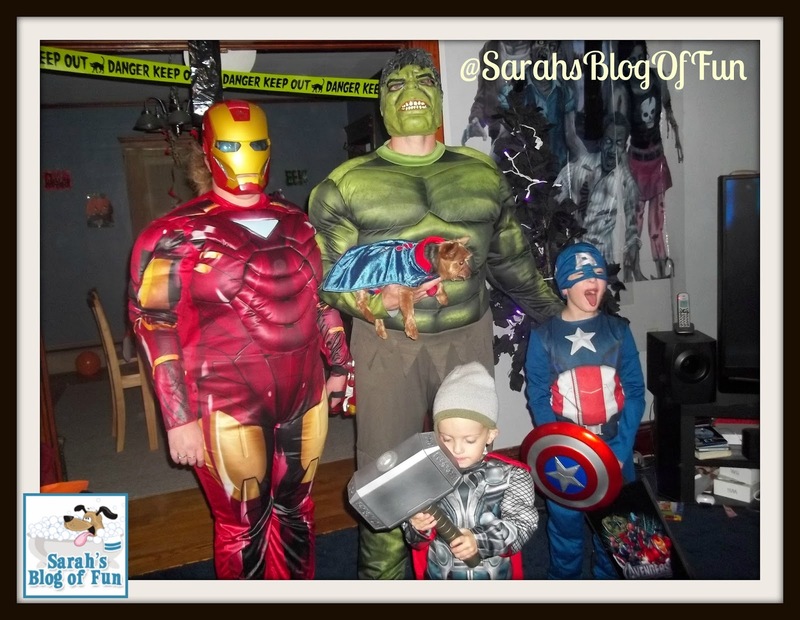 If you submit a photo of your pet using hashtag #TreatsForAll and @SarahsBlogOfFun, I will give you 5 extra entries every day!! I have 2 dogs. My beagle who is named Coco and my Sheba who is named Bacon. I also have a guinea pig too. I do dress up my beagle who goes with us Trick or Treat. She will be Toad from Nintendo. I have 4 dogs (Kandy, Shyla, Chanel and Itsy). Yes, I dress my dogs up for Halloween :) Kandy is going to be a devil and Chanel a bee. I have one dog named Nancy - she is a 4 year old chug. I have two pets. 1 cat named Sunshine and 1 dog names Jeeves. I will dress up Jeeves as a Chef this year. I have 1 furkid named Sophia. She is a puppymill survivor for 3 years now and finding out how life is outside of a cage and is loved. She is a very spoiled black Pug. She has a queen outfit, so she will ride in her stroller with a shiny green blanket covering it, like she is on a throne. She loves attention, so yes, I dress her up. I have three dogs: Jack, Butterball, and Dewey Waggles. Three cats: Cheetoh, Macy and Pippi (plus a stray I feed that I named Sugarpuss), three horses: Red, Star, and Leighla, a huge rooster and two hens. No, I don't dress up the pets although I'd love to. Jack would be a superhero and Dewey Waggles should be Elvis (he's a hound dog). We've always talked about being the Scooby Doo crew - Jack would make an awesome Scooby - he'd do anything for a Scooby snack. I have a cute little Maltipoo dog named Gizmo. My little dog wore a skeleton sweater for Halloween. I bought my dog a Piglet costume, but she didn't get to show it off this year :( It was rainy, so she couldn't go with us to an indoor Halloween party. I have 2 shelties, Holly and Murphy. I have two dogs, Scout and Olive.